Heat oven to 325°F. Grease 2 large cookie sheets with 1 tablespoon of the olive oil. In small bowl, stir together rosemary and oregano. Rub chicken breasts with 1 tablespoon of olive oil; rub rosemary mixture over chicken. In 12-inch nonstick skillet or grill pan, cook chicken 3 to 4 minutes on each side over medium-high heat or until juice of chicken is clear when center of thickest part is cut (165°F). Remove chicken from skillet; let stand 10 minutes. Slice each chicken breast into 1/2-inch slices; cover to keep warm. Meanwhile, lightly flour work surface and rolling pin. Roll each biscuit into 6-inch round. Using fingertips, make dimples in each biscuit. Brush tops with remaining 2 tablespoons of olive oil. Sprinkle with garlic powder and about 1/3 cup thinly sliced onions; press into dough. Place on cookie sheets. Place cookie sheets on separate oven racks. Bake 14 to 17 minutes or until light golden brown, changing position of cookie sheets halfway through baking. Meanwhile, in small bowl, stir together feta cheese, cream cheese and garlic. 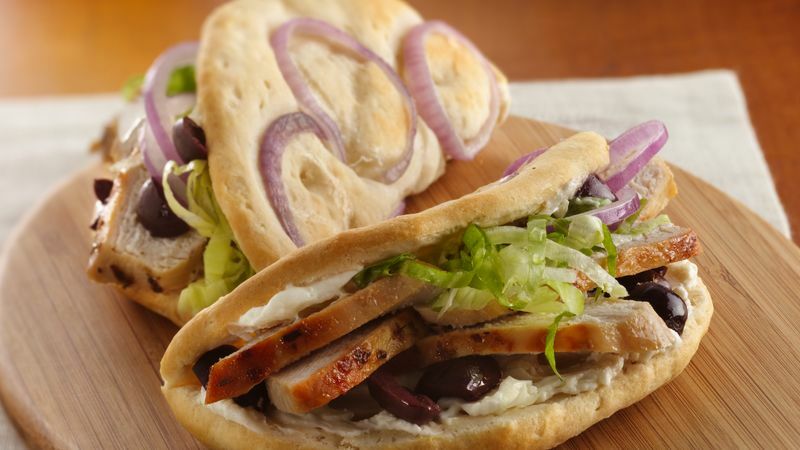 To assemble sandwiches, place faux-coccias, onion side down; spread feta mixture over each. Sprinkle with olives. On half of each faux-coccia, layer 1/8 of warm chicken, lettuce and remaining onion slices. Fold each in half to form sandwich.